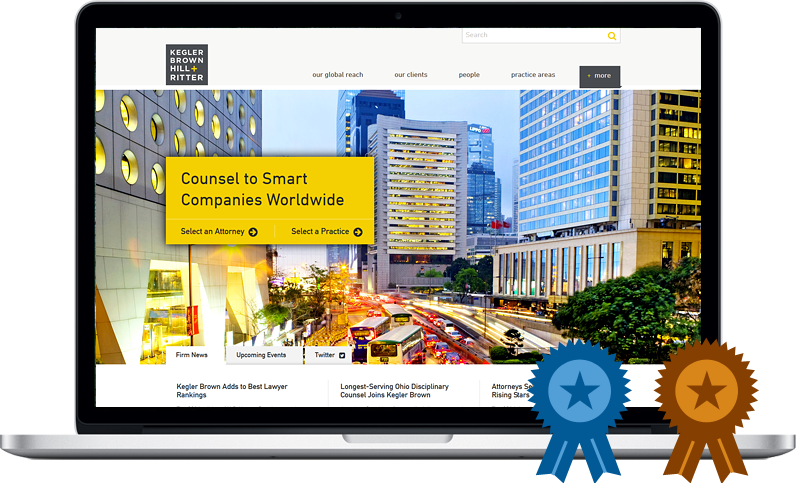 The Kegler Hill Brown + Ritter website was honored as one of the top law firm websites of 2014. The website, which was designed and built by Great Jakes, received an honorable mention in the category of "Total Website Refresh/Overhaul/Rebrand." It was one of four websites honored out of over 50 submissions in the website design category. Kegler Brown's website was the centerpiece of a re-branding initiative by the firm. The re-branding project, which was led by Great Jakes, included the creation of a new logo, color scheme and tagline. Additionally, the project included a four-day photo shoot in Columbus and Cleveland. Previously, the Kegler Brown website was honored as a top website in 2013 by the Columbus, Ohio, Chapter of the American Marketing Association. For more about the Kegler Brown website and re-branding project, click here to read a case study. The Your Honor Awards is the longest-running annual national award program recognizing excellence in legal marketing. The most recent installment of the awards was announced at the 2014 Legal Marketing Association Annual Conference in Orlando.